It is dangerous to remain firmly entrenched in one’s self believe. In order to improve and evolve,there needs to be constant feedback that is taken and acted upon. This applies to business establishments too. A prime reason for this has been the under-utilization of resources. What is the end result likely to be when you have the full financial capability of possessing a Mercedes vehicle and yet don’t possess the ability to drive? Of course it will be awful. The sad reality is that most business establishments do suffer from this self-inflicted phenomenon. Studies suggest that 80% of companies believe that they actually deliver the goods when it comes to proper and superior customer service. 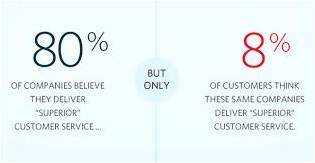 The startling fact however is that only a mere 8% of customers think that companies deliver superior customer service. There is an undeniable issue of a lack of widely available technology to support delivery ofgreat customer support services. However, the good news is that a cloud-based customer engagement software, Glad Minds, is here to resolve all those issues. Deploy now and see the difference!